Capture outstanding photos and Full HD 1080p videos from a distance, even in low light, with the COOLPIX L820. Its superb 30x optical zoom NIKKOR glass lens has both super-telephoto and wide-angle capabilities—zoom in for highly detailed closeups, or zoom out and bring the whole scene into the frame. A 16.0-megapixel low-light CMOS image sensor helps you shoot natural-looking, crisp photos at parties, weddings, concerts and more; and it's ergonomic design features a larger grip and 3-inch LCD for maximum shooting comfort, speed and control. From family reunions to travel, you'll bring home amazing memories with ease. Imagine being able to shoot without a flash at weddings, concerts, parties—anywhere your flash normally fires. You won't have to interrupt a moment to capture it, and your photos and HD videos will look more natural and true to your memory. The COOLPIX L820 performs so well in low light situations that, in most cases, using the flash is optional. Of course, when the lighting is extremely poor and you need a flash, it'll be there. If you want a compact camera that shoots stunning HD videos, the COOLPIX L820 delivers. 1080p Full HD means exceptional video quality. Record the action, then connect to an HDTV and watch your videos come alive. A built-in mic records high-quality audio in stereo. Your videos will look and sound phenomenal. Create truly exceptional photos and HD videos with the COOLPIX L820. Its high-performance NIKKOR glass lens is paired with a 16.0-megapixel CMOS low-light image sensor for superior image quality, versatility and low-light performance. Your shots will impress even you. 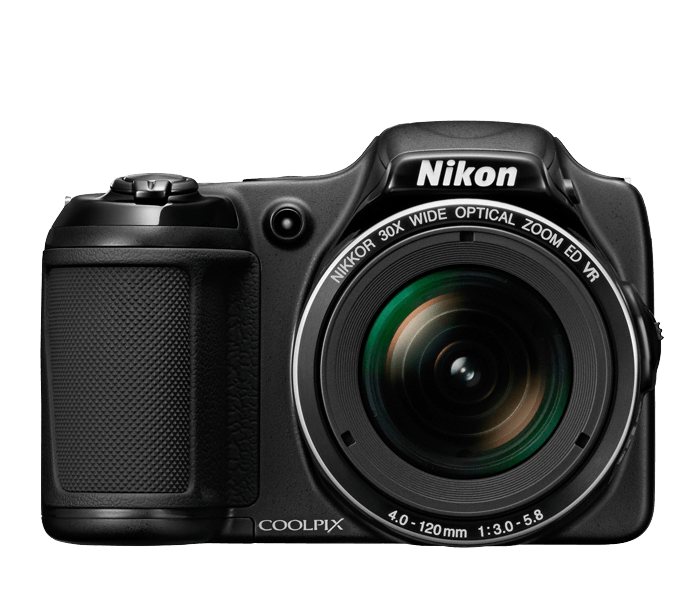 You will feel a difference when handling the COOLPIX L820 for the first time. Its ergonomic design fits comfortably in your hands and puts key controls like zoom and Movie Record right where you want them. This makes for more stable zooming, framing, shooting and video recording, and it means you won't have to take your eyes off the large, bright 3.0-inch display while you're capturing memories. Compose, review and share your photos and HD videos on a vibrant, high-resolution 3.0-inch 921,000-dot VGA display. At its widest setting, the COOLPIX L820's optical zoom NIKKOR glass lens delivers a 22.5mm wide-angle view (35mm equivalent), perfect for getting more of the scene into your shot without backing up. The COOLPIX L820 is so easy to use, anyone can take great photos and videos with it. Select Easy Auto Mode, and the camera will automatically adjust the settings to help you get better shots.